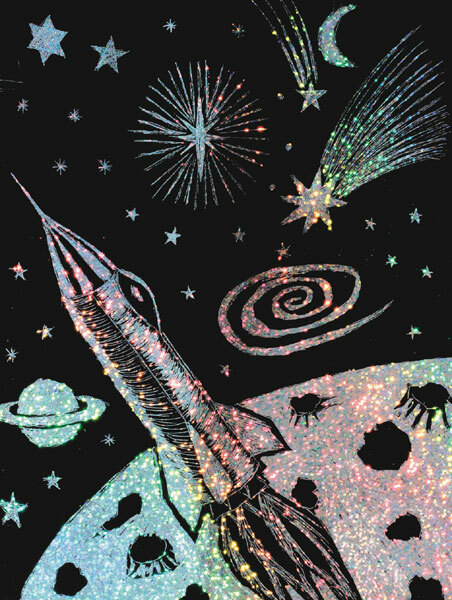 Create the most sparkling Scratch-Art pictures ever! Simply scratch this unique black or white coated board with the wooden scratch tool to reveal the glittering holographic film beneath the surface. The more you scratch, the wider the lines, and the more shimmering the results. Pictures reflect light and produce sparkling prismatic colors. Each package includes one wooden scratch tool and complete instructions. 8½" × 11" (22 cm × 28 cm).